What some people don’t know is that when Musicnotes started, it wold both music books (traditional printed sheet music) in addition to digital downloads. Mainly this was due to the fact that music publishers were hesitant to license digital distribution of their music (this was in the face of Napster and the damage file sharing had done to the recorded industry) – and so in order to provide customers a key selling point of Musicnotes, namely breadth of catalog, offering printed goods was a necessity. So to say I’ve been living in a digital world for a long time would be a bit of an understatement. But there was one weird behavior of my own that always shocked people. I never bought digital music. In fact, to this day if I had to wager a guess, I have probably purchased less than 10 songs as pure digital downloads. This isn’t to say I don’t listen to digital music though. It’s actually the primary way I consume music these days (especially since my new car doesn’t even have a CD player). Mostly I “rent” my music through Amazon and Napster (previously Rhapsody), and for the music I buy, I purchase the vinyl record or CD and use Amazon’s autorip to add the music to my digital library. The thing of it is though, my favorite way to listen to music is with a vinyl record. As an author, I write my novels (and blog posts) on a computer. But my favorite way to write is with either a pen and paper or one of my trusty typewriters. I’ve even found a new fascination with instant cameras (I have a Polaroid land camera that works … and am desperately in search of someone who wants to revive Kodak’s PR-144 format). My kids and I? When we play games together, we’re playing more and more card and board games and less video games. And the reason for this? It isn’t nostalgia. It’s deeper than that. It’s the tactility. It’s the experience this all takes. It’s the ability to disconnect from a virtual, perfect version of reality and embrace the real and physical. Interpersonal social experiences. Stimulation of all my senses. Taking time and exploring process. Imperfections and all. 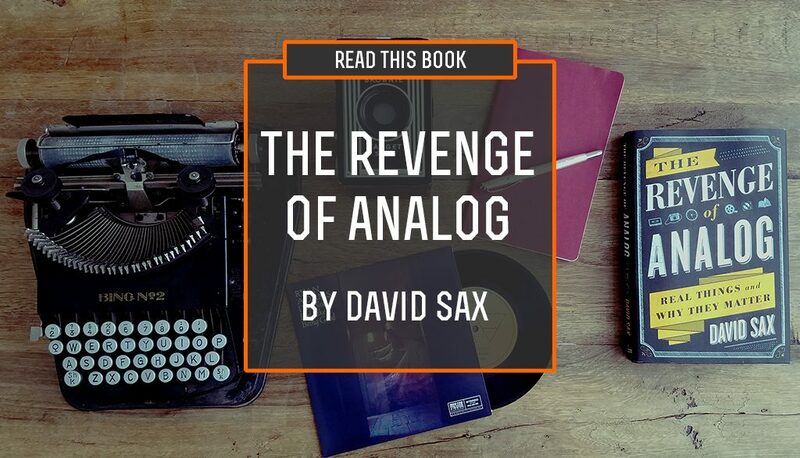 This is what David Sax writes about in his new book, The Revenge of Analog: Real Things and Why They Matter. In it, Sax covers consumer products like film, books, paper and music … but he also dives into the larger changes we’re seeing in our societal rebound from technology overload. Retail and the revival of artisan boutiques. The joy people still find in working with their hands making physical objects. Even education and its misdirected application of technology as a magic bullet to solve problems. When I first heard of the book, I admit I was a bit skeptical. It could have been a bit of a hipster guide to cool, but it was absolutely more than that. Instead Sax brings a strong journalistic background along with a vibrant intellectual curiosity to explore not only what is happening, but the deeper question of why. After 16 years, I’m no longer with Musicnotes. It’s not that I’m no longer enamored with digital. Far from it. In fact, I think we’ve only started scraping the surface of what technology can do. But having spent so much time in the digital space, I’ve also seen the weak points. The places where analog still wins out. The crossroads we’re at now is one where we need to figure out how to get analog and digital to coexist as one. How to not only integrate the two, but to get both sides to work together to build something greater than either can accomplish on their own. As Amazon is doing with their “Amazon Go” grocery concept, this is already starting to happen. How do we make our reality better through technology, without making technology our reality?